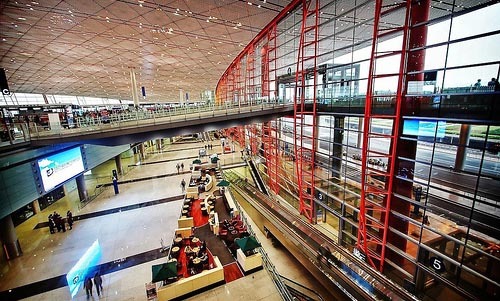 Terminal 3 officially opens on March 26th, but migration will be gradual, with Air China/Shanghai Airlines moving immediately and other carriers following later. Double-check your departure terminal before arrival. Facilities on arrival include ATMs and money changers. Be aware that upon departure, porters may want 10 yuan to wheel your bags 50 meters to check-in and that most eating options are rather outrageously priced. Before you cross through security, if you want a bite to eat in the Terminal 1, there is a KFC which has lowered its prices a little, and in Terminal 2, there are 2 KFCs, and the restaurants in the basement have relatively low prices compared to what's above. A meal at any of these places should be around 20 yuan. Many people use taxicabs to reach town from the airport. Try to get the Chinese name in characters of your hotel so that you can let your taxi driver read where you want to go. A taxi from the airport should cost 70-120 yuan. You will have to pay the fee shown on the meter (make sure the driver uses it) plus 10 yuan toll for the airport expressway. Traffic jams are common. Line 1 (to Fangzhuang): 1. Liàngmǎqiáo (亮马桥); 2. Báijiāzhuāng (白家庄); 3. Dàběiyáo (大北窑)/World Trade Centre (国贸 Guómào); 4. Pānjiāyuán (潘家园); 5. Shílǐhé (十里河)/KingWing Hot Spring International Hotel (京瑞大厦 Jīngruì Dàshà ); 6. Fāngzhuāng (方庄)/Guiyou Shopping Mall (贵友大厦 Guìyǒu Dàshà). Runs 7:30-22:30. Return stops are 6, 3, and the airport. Convenient for getting to the south east of the city. Line 2 (to Xidan): 1. Sānyuánqiáo (三元桥;) 2. Dōngzhímén (东直门); 3. Dōngsìshítiáo Bridge (东四十条桥); 4. Xīdān (西单)/Civil Aviation Building (民航营业大厦 Mínháng Yíngyè Dàshà). Return stops are 4, 2, and the airport. Runs 7:00 till the last flight. Heads south-west. Line 3 (to Beijing Railway Station): 1. Yuyang Hotel (渔阳饭店 Yúyáng fàndiàn); 2. Dōngdàqiáo (东大桥, bypassed after 22:30); 3. Cháoyángmén (朝阳门); 4. Yǎbǎolù (雅宝路); 5. Beijing Railway Station (北京站 Běijīng zhàn). Runs 7:30 till the last flight. The Beijing Railway Station stop is actually at the west gate of the International Hotel (国际饭店 Guójì Fàndiàn), across Chang'an Avenue. 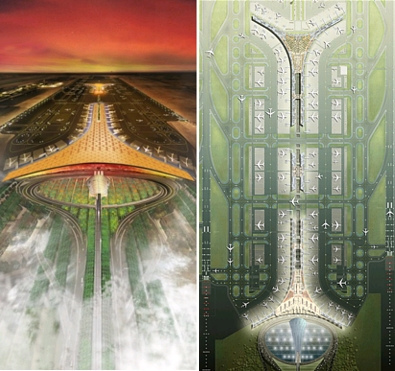 Return stops are 5, Dōngzhímén, the Jingxin Building West Gate (京信大厦西门 Jīngxìn Dàshà Xīmén), and the airport. Convenient for the city center, the southeast of the city, and Chaoyang, Chongwen, and Dongcheng districts. Line 4 (to Gongzhufen): 1. China International Exhibition Centre (国际展览中心 Guójì Zhǎnlǎn Zhōngxīn); 2. Xībàhé (西坝河); 3. Anzhen Bridge (安贞桥 Ānzhēnqiáo); 4. Madian Bridge (马甸桥 Mǎdiàn Qiáo); 5. Běitàipíngzhuāng (北太平庄); 6. Jimen Bridge (蓟门桥 Jìmén Qiáo); 7. Friendship Hotel (友谊宾馆 Yǒuyì Bīnguǎn); 8. Beijing TV Station (北京电视台 Běijīng Diànshìtái); 9. Zizhu Bridge (紫竹桥 Zǐzhú Qiáo); 10. Hangtian Bridge (航天桥 Hángtiān Qiáo); 11. Gongzhufen (公主坟 Gōngzhǔfén)/Xinxing Hotel (新兴宾馆 Xīnxīng Bīnguǎn). Return stops are 11, 7, 5, 3, and the airport. Runs from 7:00 to 23:00. Convenient for the north and north-west of the city, and Haidian district. Line 5 (to Zhongguancun): 1. Wàngjīng (望京)/Huājiādì (花家地); 2. Xiǎoyíng (小营); 3. Asian Games Village (亚运村 Yàyùncūn)/Anhui Bridge (安慧桥 Ān huìqiáo); 4.Xueyuan Bridge (学院桥 Xuéyuàn qiáo); 5. Just west of Bǎofúsì Qiáo (保福寺桥). Return stops are 5, Beijing Aeronautics University North Gate (北航北门 Běiháng Běimén), Huixin West Street (惠新西街 Huìxīn XīJiē)/Anhui Building (安徽大厦 Ānhuī Dàshà), Huixin Dongjie (惠新东街 Huìxīn Dōngjiē)/SINOPEC (中国石化集团 Zhōngguó Shíhuà Jítuán), and the airport. From 8:30 to 21:30. Convenient for the north of the city, particularly the university district within Haidian. The shuttle bus website also has a map available. It's at http://en.bcia.com.cn/traffic-manual/airport-bus.shtml. Public bus #359 also runs from the airport to Dongzhimen, where you can catch subway 2 or 13, but this is not very fast or convenient. A number of youth hostels and luxury hotels run their own complimentary shuttle buses services - do ask if where you're staying has one. The Beijing subway system should complete its spur to the airport in 2008. Nanyuan Airport (南苑机场IATA: NAY) is a former military airfield 17km to the south of Beijing, currently used only by army-linked low-cost operator China United (中国联合). China United currently fields daily flights to Harbin, Dalian, Sanya, Chongqing, Chengdu, and Wuxi. Free shuttle buses run from China United's ticket office to and from the Xidan Aviation Building (西单民航大厦). Times depend on flight schedules. Arrival: Take your taxis from the stand outside, not the touts or desks inside, and insist on the meter. If you are in a group of three or more or have a lot of luggage, touts will tell you need a minibus, and then lead you towards a people carrier in a car park, but then it will turn out they are actually leading you to a shabby taxi parked behind it, which will charge far more than the regulated fare. Be aware of another scam where impostors who pretend to work for the taxi company pose at the official-looking stands outside offering rides to the city (especially in the non-regular hours where there are not many people about). You will be led into a "taxi" with a fake meter (which could be hidden) which runs very quickly (¥200-300 to the city). Read the section on taxis for details on how to distinguish between fake and legitimate taxis. Departure: Ignore any people walking around offering to sell you an exit fee ticket/receipt. There used to be an airport construction (or exit) fee of ¥90, but now it is included in the plane ticket.